Here is the color version of yesterday’s subject. 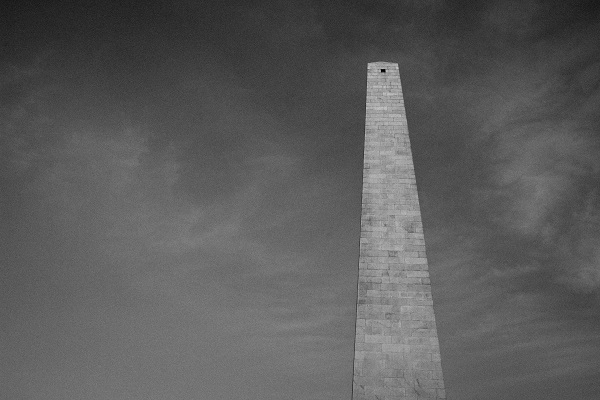 It is the Bunker Hill Monument, which commemorates one of the first battles of our Revolutionary War. I took these sunrise shots earlier this year and am just now getting around to showing them. 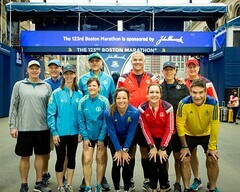 This entry was posted in boston, massachusetts and tagged boston, bunker hill, obelisk on September 30, 2017 by milfordstreet. 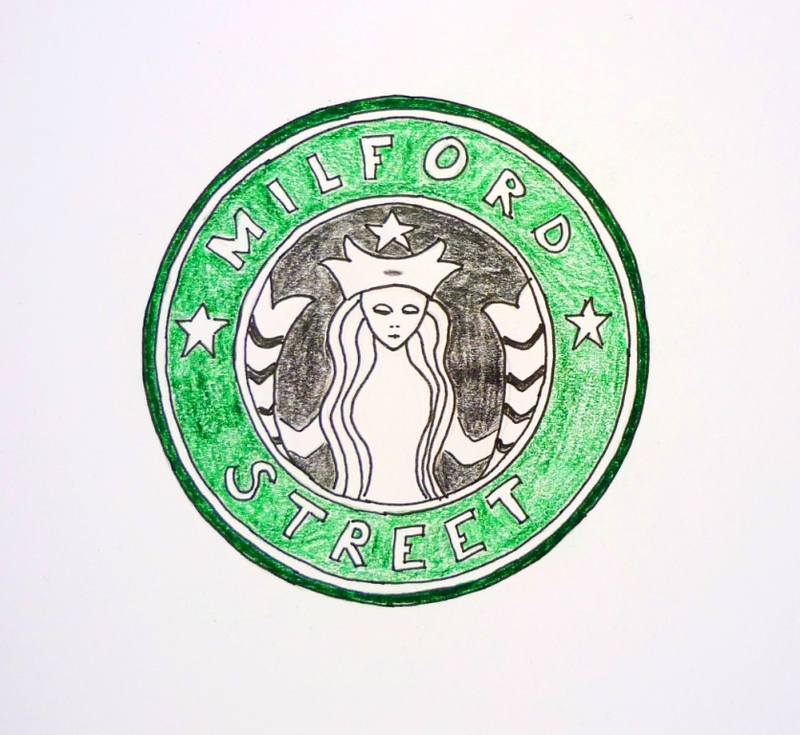 A minimalist view of an object that visitors to Boston have likely seen at least from the distance. More on this tomorrow. This entry was posted in b&w and tagged boston, obelisk on September 29, 2017 by milfordstreet. Spectacle Island is very different from George’s Island, which we’d visited the previous week. There is no old fort or any historic ruins. All of the history has been covered up. That’s because for much of the 20th century the island served as a dump for the City of Boston. 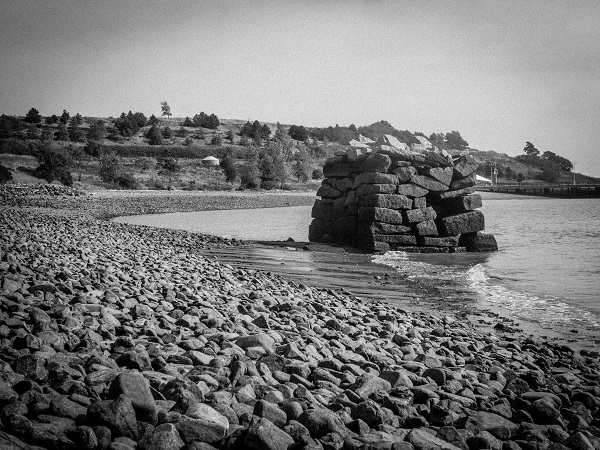 The dump closed in the late 1950s but the island remained a smelly mess for forty years. In the 1990s, the state began a massive tunneling project in downtown Boston. They decided to use the dirt and other fill from the project to cap the dump on the island. Today, the island is a beautiful park. There are large hills on either end and a visitors center with a small snack bar in the center. The hills offer amazing views of the harbor. There is a beach in which you can swim or look for pieces of sea glass. It was a wonderful place to pass a late summer day. This entry was posted in Uncategorized and tagged boston, harbor, island, spectacle island on September 23, 2017 by milfordstreet. Two weeks ago, we sailed to one of the Boston Harbor Islands on a lovely sunny day. Last week, we set sail for another of the islands on a foggy, cloudy day. But there was still much beauty to the harbor. We did see the sun later in the day. Image of Spectacle Island to come tomorrow. This entry was posted in Uncategorized on September 22, 2017 by milfordstreet. 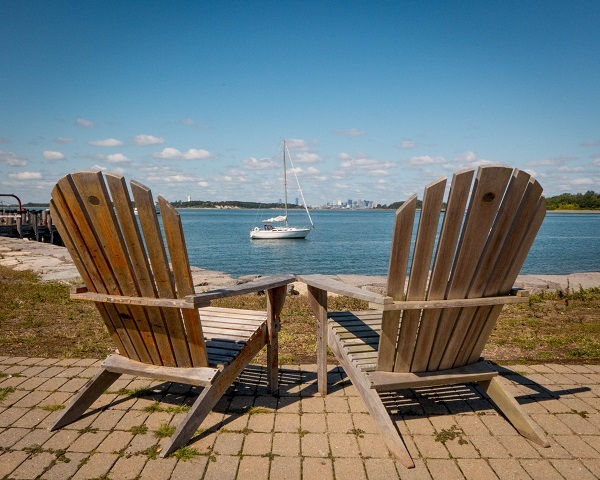 We loved these Adirondack chairs poised overlooking Boston Harbor with a sailboat just off the island and the skyline in the background. Today, we explored Spectacle Island. Both the island and the weather were quite different. I hope to show those images next week. Cheers! This entry was posted in boston and tagged boston, georges island, harbor, island on September 17, 2017 by milfordstreet. Yesterday, I wrote about taking the ferry out to George’s Island and visiting Fort Warren. We were able to enter certain parts of the fort that were deemed safe. These included rooms where cannons had been kept, the bakery, and the quarters for prisoners who were Confederate officers or political in nature. During the Civil War, the fort served as a prison for people who tried to evade the draft in the north and for Confederate soldiers from the south. For a period of time, the Vice President of the Confederacy, Alexander Stephens, was held here. This is a collection of rooms. I chose them more for their aesthetic rather than historic value. There are two images of the powder magazine because I could not decide if I liked color or BW better. This entry was posted in boston and tagged boston, fort warren, georges island, harbor, island on September 16, 2017 by milfordstreet.